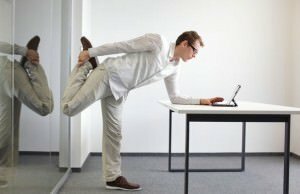 There are millions of people who have to sit all day at work and exercise only when their job allows it. Most of us are so exhausted by the time we get back home that working out is quite possibly the last thing on the list of things we feel like doing. The problem is that sitting all day at work and doing nothing at home can take some serious toll on our health. To make matters worse, those folks who want to change something don’t know where to begin. If you’re one of those people, you might want to check out a couple of these tips, they might help you out. We know what you’re thinking and the answer is: no, we don’t want you to walk 25 miles to work every day as a way to stay physically active. For instance, you could go to work by car, but instead of parking in front of the place you work at, park your vehicle a mile or two away and then walk to work. Get up 20 minutes earlier in the morning and you should have more than enough time for everything. 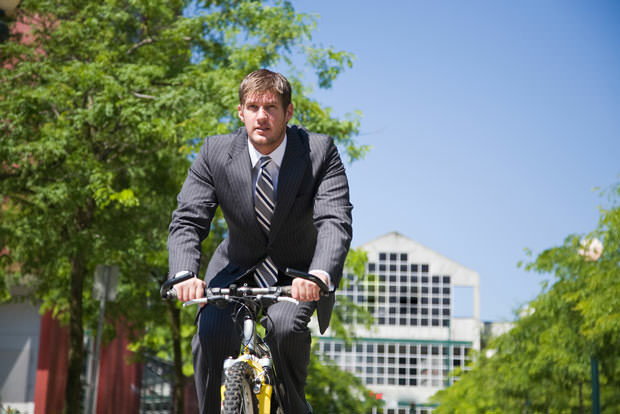 If the distance between your office and your home isn’t too much, a ride on your bike would give you the kick you need. Or, if you use public transport to reach your workplace, get off two stops before your destination and take a light stroll. If we were to calculate how many calories you would burn just by taking the stairs instead of the elevator, you would probably faint. Not only that but climbing the stairs also helps with increasing your stamina, strengthening your leg muscles and building overall endurance. Don’t worry about losing your breath after a couple of steps, make a short break and keep going on at a lighter pace. Just relax and take it slow, you will feel the benefits in no time. If you have a desk job, the most basic thing you can try to correct is in the very essence of the problem – try standing up! Look for opportunities that allow you to stand. For instance, walk around the office while talking on the phone or proofreading. Need to ask Sally from the accounting department for some phone numbers? Don’t send an e-mail, walk to her office, exchange some gossip with her while you’re at it, just stand. You can even take things to a whole new level and invest in a standing desk. Instead of rushing (or more like dragging) to the coffee machine, why not find someone who’s willing to take a walk around the yard or make a turn around the block? You will activate your leg muscles and breathe in some much-needed fresh air. For additional benefits, you might want to try keeping dumbbells or hand weights and resistance bands near your desk and exercise with them during break time. This is something that many people forget, but if you’ve organized your work environment so that you can reach everything from your chair, it does make you slightly more time-efficient. However, it also prevents you from having a reason to stand up for eight hours, which is catastrophic. Reorganize your workspace so that you have to get up to answer the phone or reach out to grab something. Additionally, you can really live without your comfy chair – why not use an upright one without armrests? This will help you sit straight, which means you will burn calories by keeping your core, back and shoulder muscles engaged.